Police offi­cers on the fifth floor had breached a floor-to-ceil­ing win­dow and some were out­fit­ted with climb­ing cables and hard hats. A large inflat­able cush­ion had been placed on the side­walk in front of the main entrance, pre­sum­ably to save the man if he jumped. He also affixed sev­er­al fly­ers to the façade, which depict Osama Bin Laden play­ing Gepet­to to Bush’s Pinoc­chio, and adver­tis­ing his web site. CNN has a video of the climber, as well as the afore men­tioned “large inflat­able cush­ion”. After four hours, Mal­one sur­ren­dered to police, and was arrest­ed just after 5 a.m. this morn­ing. 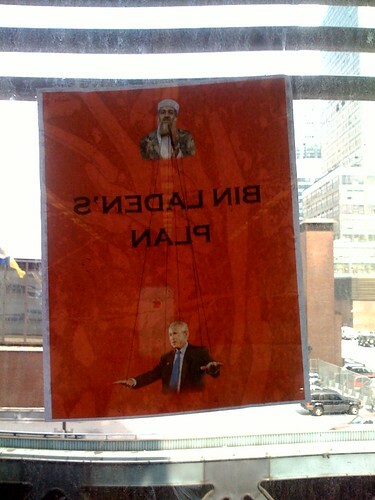 A flyer left by the climber, on the 7th floor. 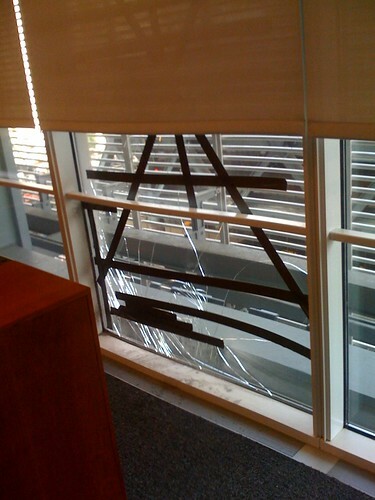 City Room reports that police breached a 5th floor window, and put on climbing gear. 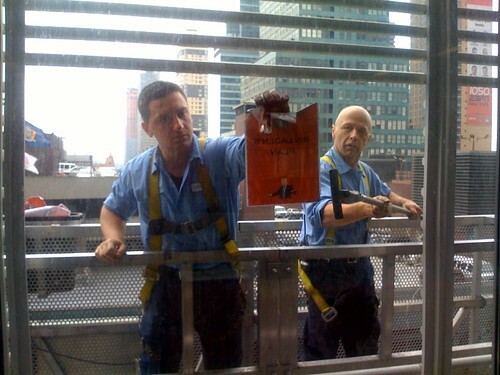 Workmen remove a flyer left behind by the climber.